When I was growing up on Central Park West in New York City, my grandmother saved all bits of stale bread to bring to the pigeons in the park. Often I would accompany her as she tossed the crumbs from the crumpled brown page, and watched how the pigeons flocked to her. So the pigeons were my friends, and I thought of them as quite ordinary until I visited Italy at 16 and saw how the pigeons in St. Marks square were a national tourist attraction. I must admit that when they took flight at sunset, and the golden sun burnished their wings, they seemed a lot more magical than my old friends in Central Park! Years later, when I dated a french chef, he encouraged me to order the pigeon one night at dinner. When I recounted my attachment to pigeons he assured me that the pigeon on the menu was an entirely different breed, so I succumbed. It was quite delicious. I've longed wondered if he had been lying though. Moving from New York City a year ago I thought I was leaving pigeons behind but low and behold: on a recent trip to the local ice cream store one evening after dinner the pigeon pictured above landed on the ledge right near me and proceeded to walk toward me. 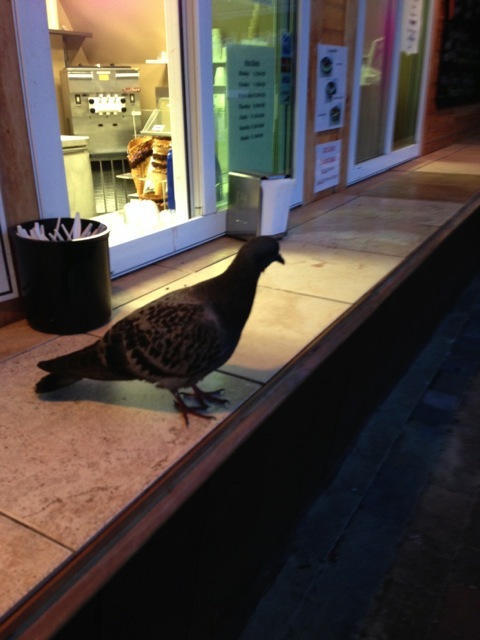 He wasn't going for my ice cream but rather for the fall out from other orders, such as tiny little sprinkles which he managed top peck up one at a time. I admired the pigeon's courage to come so close to a stranger and not even flinch when I took the picture. But then he had to have been a New York bird--I've never seen a pigeon in our area of New Jersey before. And New York birds have attitude. The Baking Bible's First Review!